Just a minute away from car horns and chaos of Arden Fair Mall is the home of Sacramento Taiko Dan, the oldest local organization dedicated to the art of Japanese percussion. Inside a blue, inconspicuous warehouse you’ll find racks of drums of all sizes and wear stacked on high. In the middle of the space stands the showstopper, the highly-decorated odaiko, or “big fat drum,” made by famed Asano Taiko. Though silent now, in just a few hours, the dojo will be filled with thunderous rhythms. Greeting us for this month’s installment of Sacramento365’s Featured Artist Series is Sacramento Taiko Dan’s Sascha Molina, dressed in a traditional happi, a decorative, thin-fabric coat, and hachimaki, a traditional headband. A member of the organization for the last 12 years, she swiftly climbed the ranks, moving from student to now the Assistant Artistic Director and the Director of the Sacramento Taiko Dan Youth Ensemble. 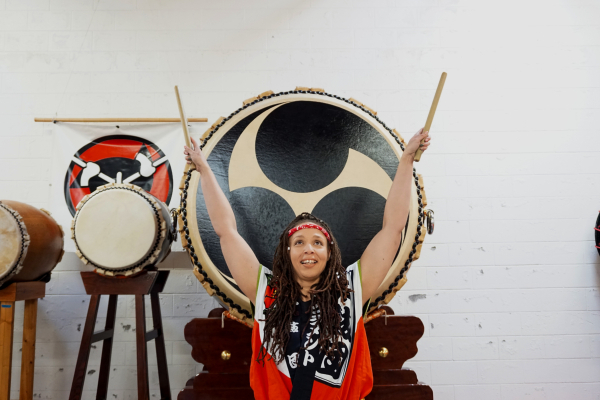 As an instructor, she focuses on giving others opportunities to grow and learn life skills through music and cultural literacy — just as Sacramento Taiko Dan has done for her. 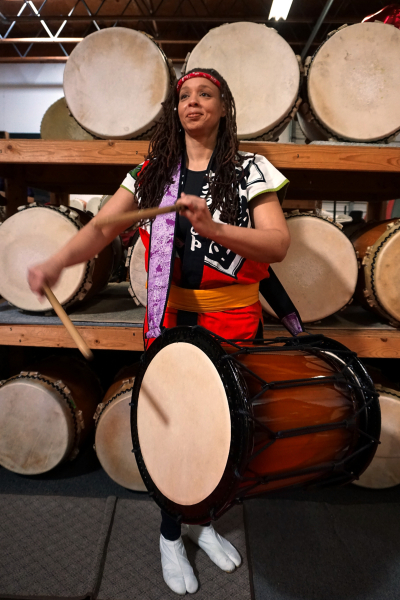 Read on to learn more on how Molina found her rhythm — and purpose — in Sacramento Taiko Dan. Taiko, literally meaning “drum,” is an ancient form of percussion, used as the soundtrack of warfare and religious ceremonies for centuries in Japan. Despite regional differences, all taiko practice is defined by its structured choreography, drumbeats, and shouts. In 1989, Executive Director Tiffany Tamaribuchi founded Sacramento Taiko Dan out of necessity: at the time, there was no organization dedicated to the cultural art in the region. Since inception, the nonprofit has been on a mission to promote cultural awareness through quality performances and instruction throughout Sacramento. So how did Molina, a SoCal transplant, get involved with Sacramento Taiko Dan? A lifelong fascination with Japanese culture explains part of it. 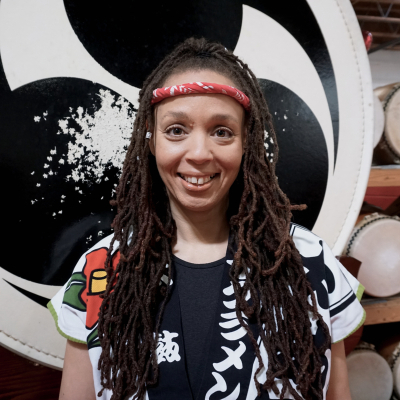 After years of searching for Taiko courses down south, she found Sacramento Taiko Dan online after moving to Sacramento 12 years ago. She was finally able to connect with the rhythms and movements she fell in love with on YouTube. 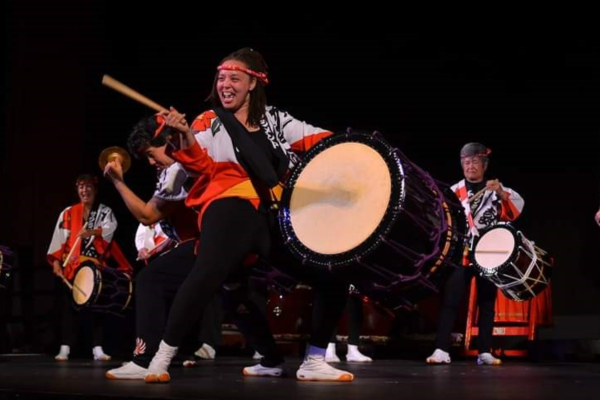 Being one of the last students standing from her introductory class helped get her noticed; she quickly moved up to the intermediate player group and eventually became a part of Sacramento Taiko Dan’s leadership. Five years ago, she then made the transition to Assistant Artistic Director, focusing on program outreach and youth education (she’s also currently the Director of the Sacramento Taiko Dan Youth Ensemble). And her schedule is hectic, to say the least. Throughout the week: Special events, school assemblies/school performances, Artist in Residence commitments, etc. And, oh yeah, she does all this work for free. 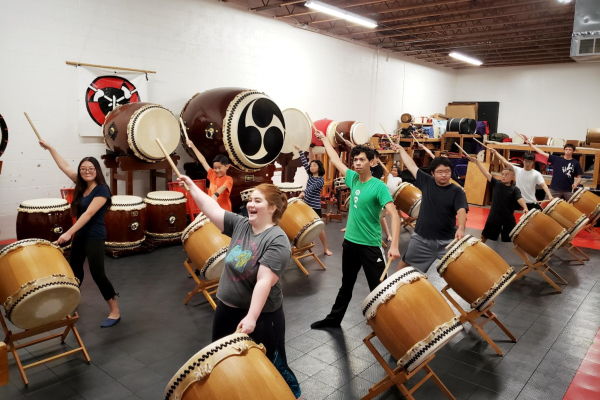 To help make ends meet, Molina teaches taiko independently at University Charter Prep in El Dorado as part of its Asian Studies Program. While grueling, teaching for Molina, is important. Not only does she wish to educate others on the historical significance of taiko, she also hopes that her presence will squash the misconception that cultural arts are exclusionary. “I love how taiko connects me to so many people and lets me watch people grow,” she continues. While Molina finds the Sacramento arts community thriving and supportive – “as a community that has really done a lot without a lot of funding” — her perception of the state of our arts education is less than stellar. Molina cites that taiko, like sports, teaches the fundamentals of humility and team-building: students learn coordination, collaboration, and coping mechanisms — just with a bellowing beat. Thankfully, Molina and Sacramento Taiko Dan are increasing student arts exposure by participating in the Any Given Child Program (AGC). Developed in partnership with The Kennedy Center for the Performing Arts, and administered locally by the Sacramento Metropolitan Arts Commission, AGC provides access and equity to arts education during the school day for K-8 students in the Elk Grove Unified, Robla, Sacramento City Unified, and Twin Rivers School Districts. It does so with teaching artist residencies, arts exposure experiences (e.g. school assemblies), and professional development. Photo courtesy of Sacramento Taiko Dan. Sacramento Taiko Dan is currently involved in AGC’s artist residencies and arts exposure initiatives. During school assemblies, adult performers speak on Japanese culture, perform, and even let students try their hand on a drum. These performances, however, last just 45 minutes. Outside school hours, Sacramento Taiko Dan performs throughout the community and offers youth and adult taiko instruction — equity and access always top of mind. This year marks Sacramento Taiko Dan’s 30th year. To celebrate, the group is putting its energy into two events, honoring both its past and its vision of the future. On May 2, the nonprofit is hosting international taiko group, Shidara, at the Community Center Theater. The group expects to highlight its resiliency with a knock-out concert this September — its venue and program to be determined. *Terms were slightly modified from Taiko.com. Molina squashes a few misconceptions on the performing art. Do you need a background in music or percussion in order to play taiko? Though helpful, it’s definitely not a pre-requisite. If you like to dance, listen to music and feel the groove, you can play! You must be young to perform? Thankfully, taiko is for all ages. You have to be Japanese to participate. Wrong, this cultural artform is open to anyone who wants to try. Do you need to speak Japanese? Nope! Most Taiko players in North America do not speak Japanese, but if you want to pursue a professional career in taiko, I would recommend learning Japanese. While not Japanese, Molina does have a family connection to the island nation. Her grandfather, Ervie Lee Jones Sr., was stationed in Okinawa, Japan. Sacramento Taiko Dan is one of Sacramento Metropolitan Arts Commission’s 59 Cultural Arts Awards grantees. Molina is also an Any Given Child Artist in Residence. When Molina isn’t working, you might find her perusing Crocker Art Museum collections or walking along the American River. *The best source for Sacramento Taiko Dan updates. Have questions about Sacramento Taiko Dan? Email Sascha Molina at sascha124@hotmail.com.